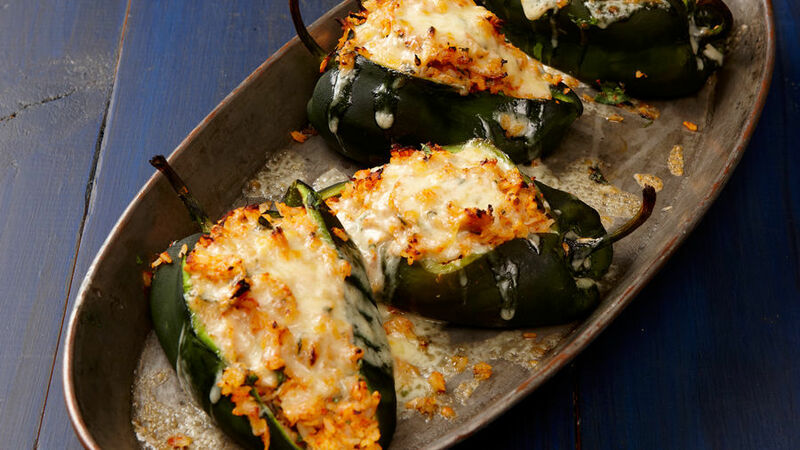 These are not the stuffed peppers of your childhood—they’re better. Poblano chiles are rich and flavorful with a mild to medium heat. Using leftover roasted chicken and cooked rice speeds up the already quick prep. Position an oven rack about 4 inches from the broiler and heat the broiler on high. Line a large rimmed baking sheet with foil. Slit the chiles from stem to tip and set on the baking sheet. Broil, turning every few minutes, until blackened all over, 5 to 8 minutes. Let cool slightly, peel off the skins, and cut out the seed cores, leaving the stems on. Turn the chiles inside out, flick out any remaining seeds, and turn right side out. Return the poblanos to the baking sheet. Broil the peppers until the cheese is melting and the top is beginning to brown, about 4 minutes. 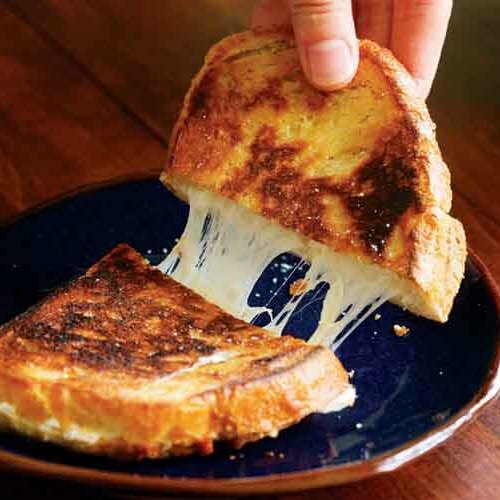 Top with the remaining 1 cup cheese and broil until the cheese is completely melted, about 2 minutes. Jícama, Radish, and Pickled Shallot Salad with Feta is the perfect way to start this meal. This is a great recipe. It makes a wonderful vegetarian meal with black beans. The seasonings are wonderful. This recipe is a keeper! I added 1/4 tsp of cayenne to the puree mix, used chicken from a rotisserie chicken and used a can of drained diced tomatoes in place of fresh ones (the ones at the grocery store in February are horrible). We loved it.